Why Design a New Trapping System? 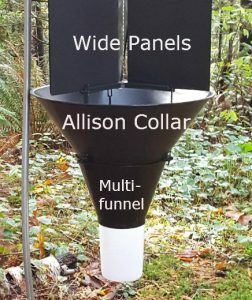 The multiple funnel trap introduced by Dr. Staffan Lindgren over 35 years ago has proven to be a versatile tool for trapping ambrosia, bark and wood boring beetles. However, after three decades of use we felt we could improve some features. We have been inspired by the research of Dr. Peter deGroot, Dr. Darrell Ross, Dr. Dan Miller, Dr. Jeremy Allison, Dr. Joe Francese, Dr. Damon Crook and others to conduct our own trap design experiments over the last several years. 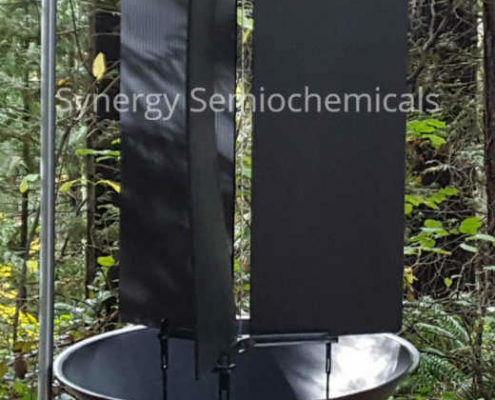 We are pleased to offer new innovations to the industry classic standard trap to bring you the Synergy Semiochemicals Multitrap System (patent pending). Click here to watch the assembly videos and read the technical bulletins for the Synergy Multitrap System. The Multitrap System (patent pending) has a set of modular parts from which a variety of trap configurations can be constructed. Each trap comes with your choice of wet or dry cup. The new system is simple, adaptable and robust. Additionally, it can offer better capture of higher species diversity when compared to conventional funnel traps. We have favorably priced the Synergy Semiochemicals Multitrap System to be more economical as compared to traditional traps. Please note that due to the significant design changes, Multitrap components, including cups are not backwards compatible with old style Lindgren traps. The trap can be built as a multiple funnel trap, a three vane panel trap or custom designed as a combination of funnel and panel trap. New larger funnels will allow modern UHR release devices to be hung inside the funnels, exactly as Lindgren had originally suggested, in order to attain maximum dispersion of semiochemical plumes. More surface area on each funnel can help catch more beetles. 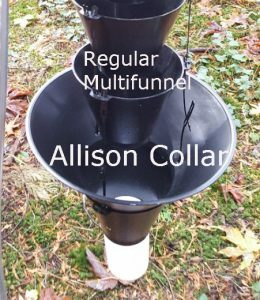 The optional large “Allison Collar” can significantly improve captures of Cerambycids, large wood boring beetles such as Monochamus species and Bruprestids. Multitrap system comes in a variety of colors for funnel or panel traps. The trap can be easily and quickly configured for heavy duty mass trapping applications or as a light weight survey trap. The redesigned insect collection cup has been enlarged to increase the capacity of the original size. Cups can be used wet or dry. Dry cups have larger stainless screens mounted in the bottom for better drainage. Collection cups simply drop into place on the last funnel eliminating the need for a special ‘bottom’ funnel. There are no ridges to impede the path of insects falling into the collection cup. The new Synergy Semiochemical Multitrap design prevents broken flanges on the collection cups and cups falling off the traps. Each trap comes with a canopy, connector straps and a wire hanger. Synergy’s new Multitrap platform (patent pending) allows you to configure a panel or a funnel trap and to alter these as your needs change. When deciding between a funnel vs. a panel trap, if cost is an issue, the panel trap may be a better choice. We have each part of the Multitrap available as a separate component so that you can custom build your trap. Color is a critical attribute when trapping Bruprestids like Emerald ash borer. The Synergy Multitrap System will empower experimenters to change trap colors easily when configured as a panel trap. Commercially available corrugated polypropylene (Coroplast) is available in a rainbow of colors and can readily be cut and mounted in the Multitrap panel trap. 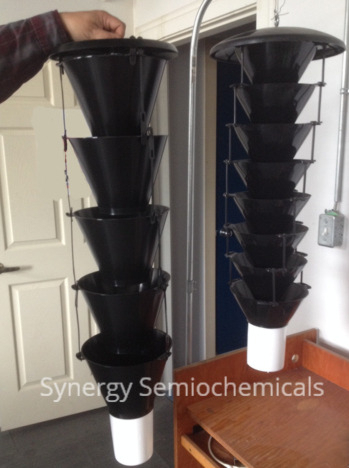 Synergy Multitrap funnel traps are available in black, EAB green and purple. Our standard panel dimensions are 4.25″ x 24″. Large panel dimensions for use with the Allison Collar are 8.0″ x 24″. The Synergy Semiochemicals Multitrap funnel or panel trap can utilize the optional “Allison Collar”. The addition of the large collar can significantly improve captures of Cerambycids, large wood boring beetles such as Monochamus species and Bruprestids. Our newly designed insect collection cups have been enlarged to hold bigger beetle catches. The connection to the bottom funnel on the trap is no longer via a click and lock system. We now have a an easy drop-in assembly with no lip needed on the cup. This eliminates cups breaking off the bottom funnel like some of the old ones did. Each trap is sold with a newly designed wet or dry cup. How do I choose which style cup to use? The dry collection cup has a big metal screen in the bottom which is more effective for drainage. Inserting small pieces of insect-catching strips in the bottom is an easy way to prevent beetles from crawling or flying out of the cup. 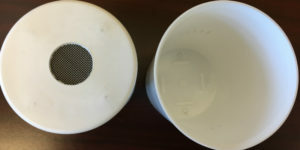 The wet collection cup has drainage holes on two sides of the cup to prevent overflow of liquid such as rainwater or antifreeze (used to kill and preserve beetle catches). The advantage of a wet cup is that beetles caught in antifreeze are kept intact for identification, sorting and counting. The beetles captured are generally not dismembered from predators nor damaged from the cups being banged and knocked about on the trap. Furthermore, the antifreeze in the bottom of the cup can be reused. 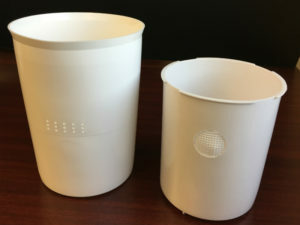 Wet cup contents can be filtered through a paper paint filter, capturing the beetles on the paper while the antifreeze is collected and reused in the cup. Panel traps can be a cheaper alternative to the funnel traps. They are easily customizable using commercially available corrugated polypropylene (Coroplast) in a rainbow of colors. Coroplast can readily be cut and mounted in the Multitrap panel trap. The Multitrap three panel design is lighter than the conventional four panel trap, and will intercept insects flying from any direction while still retaining the same visual profile. Furthermore, three panel traps have superior performance to four panel traps in windy conditions because there is less surface area to act like a kite. Product #4062 : Multitrap Wide black panel trap with Allison collar, panels 8″ x 24″ dimensions. For other color panels, please contact us. We treat your funnel or panel traps with fluon for you. Bottle of fluon suspension with an applicator sponge. Kit contains enough fluon to treat approximately 400 funnels. like bruprestids (EAB), Chalcophora, two-lined chestnut borer or cerambycids (Monochamus, Tetropium, Xylotrechus). Fluon doesn’t appear to be efficacious for bark beetles or ambrosia beetles. An aqueous suspension of fine PTFE (Fluon) is applied to the trap outer surface. The fluon coats the funnels and panels causing beetles to slide more readily into the collection cup, rather than flying away. Fluon treatment can also help prevent the beetles from climbing out of the traps, especially when used with dry cups. The use of Fluon is highly recommended when using funnel traps for Emerald Ash Borer. EAB trap captures in funnel traps increases greatly after Fluon treatment. Research from Graham and Poland showed that fluon treated panel and funnel traps catch significantly more cerambycids spp. Allison et al. have documented the effect of dilution of fluon on traps.